In brief: The laws of physics allow members of an exceedingly advanced civilisation to travel forward in time as fast as they might wish. Backward time travel is another matter; we do not know whether it is allowed by the laws of physics, and the answer is likely controlled by a set of physical laws that we do not yet understand at all well: the laws of quantum gravity. In order for humans to travel forward in time very rapidly, or backward (if allowed at all), we would need technology far far beyond anything we are capable of today. Click here for a larger version of the graph. If Florence's clocks and aging report a round trip time of 10 years, Methuselah will have aged by 25 years. If Florence aged 30 years, Methuselah will have aged 4,500 years. If Florence aged 88 years, Methuselah will have aged 14 billion years, which is the current age of our Universe! Unfortunately, no known rocket fuel, not even thermonuclear fusion, is capable of producing the sustained multi-year-long acceleration required for such a trip. A massive black hole is another vehicle for rapid forward time travel: If Methuselah remains in orbit high above the event horizon of a massive black hole (say, one whose gravitational pull is that of a billion suns) and Florence travels down to near the event horizon and hovers just above it for, say, 30 years and then returns, Methuselah can have aged thousands or millions of years. This is because time flows much more slowly near a black hole's event horizon (where the acceleration of gravity is huge) than far above it (where one can live sedately). These time travel phenomena have been tested in the laboratory. Muons — short-lived elementary particles — travelling around and around in a storage ring at 0.9994 of the speed of light, at the Brookhaven National Laboratory on Long Island, New York, have been seen to age 29 times more slowly than muons at rest in the laboratory. And atomic clocks on the surface of the Earth have been seen to run more slowly than atomic clocks high above the Earth's surface — more slowly by about 4 parts in 10 billion. We physicists have been working hard since the late 1980s to understand whether the laws of physics allow backward time travel. We do not have a definitive answer yet, but the likely answer has been summarised by Stephen Hawking, in his Chronology Protection Conjecture (see ): The laws of physics always conspire to prevent anything from travelling backward in time, thereby keeping the Universe safe for historians. We physicists have identified two mechanisms that might protect chronology: (1) The exotic material that is required in the manufacture of any time machine might be forbidden to exist, by the laws of physics — forbidden to exist in the large amounts that time machines always require. (2) Time machines might always self-destruct, explosively, when one tries to activate them. These mechanisms (1) and (2) are descriptive translations of mathematical results that we physicists have derived using the laws of physics expressed in their own natural language: mathematics. The sentences (1) and (2) capture the essence of our calculations, but crucial details are lost in translation. For anyone who wishes to struggle to understand those details, good places to start are a recent beautiful but highly technical review article by John Friedman (see ), and a much less technical but older and slightly outdated article by Matt Visser (see ). A wormhole-based time machine: A wormhole is a hypothetical tunnel through hyperspace that links one place in our Universe (e.g. my office at Caltech) to another place (e.g. the Caltech football field). Each end of the wormhole (each mouth) looks like a crystal ball. Staring into it, one sees a distorted image of objects at the other end. Looking into the mouth in my office, I see the football field, distorted; someone on the football field, looking into the mouth there, sees me and my office, distorted. The wormhole (tunnel) might be only 3 metres long, so if I enter the mouth in my office and then travel just 3 metres through the tunnel, I emerge from the other mouth, onto the football field 300 metres from my office. A wormhole as viewed from a higher-dimensional hyperspace. Our Universe is the two-dimensional sheet. The wormhole is a short cut through hyperspace from one location in our sheet (our Universe) to another. Exotic Matter and Vacuum Fluctuations: We do not know whether the laws of physics permit wormholes. We do know, however, that a wormhole will implode so quickly that nothing can traverse it, unless it is held open by gravitationally repulsive forces that can only be produced by exotic matter. By the phrase "exotic matter" I mean matter that has negative energy and therefore anti-gravitates, i.e. repels. The quantum laws of physics do permit exotic matter to exist, and it has been created in the laboratory in very tiny amounts: in the so-called Casimir vacuum between two electrically conducting plates, and in the so-called squeezed vacuum that is generated by optical physicists using nonlinear crystals. The key to this negative energy is the fact that empty space (the vacuum) is filled with tiny fluctuations of all kinds of matter and fields that exist in the Universe. It is impossible to make these fluctuations go away. They are a consequence of the quantum mechanical uncertainty principle: if, at one moment of time, there are no fluctuations at all of (for example) the electromagnetic field, then the rate of change of the fluctuations must be infinitely large and a moment later the fluctuations will be enormous. The product of the strength of the fluctuations and the magnitude of their rate of change is always bigger than a certain limit, given by the uncertainty principle. As a result, fluctuations are always present. We call them vacuum fluctuations because they are a property of the vacuum, i.e. of otherwise empty space. The Casimir Vacuum: When two electrically conducting plates are placed very close together, the vacuum fluctuational electric field parallel to the plates is strongly suppressed while that perpendicular to the plates is little affected. The suppression reduces the fluctuational energy between the plates below what it would be in plate-free empty space, so the vacuum between the plates (the Casimir vacuum) acquires negative gravitating energy. It has loaned some fluctuational energy to the electric fields inside the plates. The plates have catalysed this lending. Wormhole held open by Casimir Vacuum: Two concentric spherical conducting plates are placed at the throat of a wormhole, with a tiny separation. (One dimension is suppressed here, so our Universe is a 2-dimensional sheet and the plates look like circles rather than spheres.) If the plates' energies (including their mass's energy E=mc2) are small enough, then the repulsive gravity due to the Casimir vacuum between the plates can hold the wormhole open. The laws of quantum physics say that vacuum fluctuations produce no gravity — or perhaps only an exceedingly tiny amount of gravity: the gravity that is accelerating the expansion of the Universe. In other words vacuum fluctuations may be responsible for the so-called cosmological dark energy. But that dark energy is so tiny (10-121 in dimensionless numbers) that it is irrelevant for my discussion of time machines; so I shall say that the quantum fluctuations produce no gravity at all. Or, rather, they produce no gravity under normal circumstances. One can devise ways, in fact, to make one region of empty space lend some of its vacuum fluctuations to an adjacent region. (This is what experimental physicists do with the Casimir vacuum and with the squeezed vacuum.) When this happens, the lending region is left with a negative amount of gravitating energy, and the borrowing region gets positive gravitating energy. The quantum laws place tight constraints on the amount of fluctuational energy that can be loaned. The larger the size of the lending region, the less energy it can loan and therefore the less negative its energy can become. This is true in the Casimir vacuum, in the squeezed vacuum, and in all other variants of exotic matter. The laws of physics dictate it. My personal guess is that these constraints on exotic matter do not prevent wormholes from being held open and thus do not protect chronology, but I could well turn out to be wrong. To learn the truth, we physicists must develop a deeper understanding of quantum theory in warped spacetime than we now have — i.e. a deeper understanding of the combined laws of quantum theory and general relativity, the laws of quantum gravity. As the travelling mouth is returning to Earth, there comes a first moment when its wormhole can be used to travel backward in time. The first thing that can do so, and thereby meet itself before it left, is an entity that enters one mouth, exits from the other before it entered, and then flies through the Universe back to its starting point at the highest possible speed, the speed of light — arriving back at the first mouth at precisely the moment it started its trip. Even if no light or other light-speed radiation travels on this round-trip time-travel route, vacuum fluctuations will always do so. They cannot be stopped. Upon arriving back at their starting point at the very moment when they left, the vacuum fluctuations will pile up on top of their younger selves. The result is a duplicate of every fluctuation, and then, with another round trip, a quadrupling of every fluctuation, and so forth. 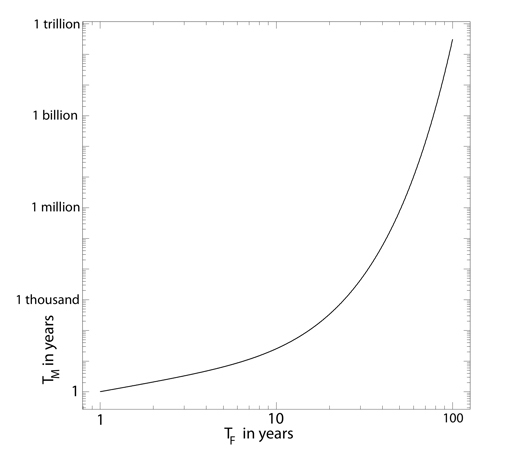 The bottom line, according to a calculation that I did with my postdoc Sung-Won Kim in 1990, is an explosive flow of gravitating fluctuational energy through the wormhole at precisely the moment when time travel is first possible — at the moment of time machine activation . Will this explosive fluctuational energy destroy the wormhole and thence the time machine? At first Kim and I thought the wormhole could survive. However Stephen Hawking gave strong arguments to the contrary, in his seminal 1991 research paper on chronology protection. The explosion is very likely to destroy the time machine when it is first activated, Hawking argued — and not just this time machine, but any time machine that even the most advanced civilisation might conceive and build. Over the next few years many other physicists weighed in, with analyses of other time machine designs, and it began to look like Hawking might be wrong: a sufficiently clever design might protect a time machine from self destruction. Then in 1996 Bernard Kay, Marek Radzikowski and Robert Wald developed a powerful mathematical proof that the version of the laws of quantum physics which we were all using to analyse time machine self destruction are incapable of revealing the explosion's outcome. The outcome is held tightly in the grip of the laws of quantum gravity, which we do not yet understand fully. The fate of any time machine? Hawking and I have a long history of bets with each other, about unsolved mysteries in physics. But we are not making a bet on this one, since for once we are on the same side. When we physicists have mastered the laws of quantum gravity (Hawking and I agree), we will very likely discover that chronology is protected: the explosion always does destroy any time machine, when it is first activated. In June 2000, on the occasion of my 60th birthday, Hawking presented me with a tentative analysis of the explosion's outcome, using his own tentative version of the laws of quantum gravity. His conclusion: if I try to use a very advanced civilisation's wormhole to travel backward in time, the quantum mechanical probability that I will succeed is one part in 1060; see Hawking's article in my birthday party book, . That's an awfully small probability of surviving the explosion. Given the opportunity to try, I would not take the risk. Other time machines: It is amazing what we can learn from the laws of physics, when we understand them well. One famous example is the laws' absolutely firm insistence that it is impossible to construct a perpetual motion machine, even if one has all the tools of an exceedingly advanced civilisation. Another example is a proof by Hawking that to make a time machine, no matter how one goes about it, one must use exotic matter — matter with negative energy — as an integral part of the device; wormholes illustrate this, but it is true in general. And a third example is the proof by Kay, Radzikovsky and Wald that the laws of physics as we now know them will break down whenever a time machine is activated, no matter how one designs the machine. Again wormholes are just one example. Hawking's theorem, and that of Kay, Radzikovsky and Wald, tell us that the fates of all time machines are held tightly in the grip of the laws of quantum gravity. Progress in the quest to understand quantum gravity has been substantial over the past two decades. Complete success will come, I am convinced, within the next two decades or so — and it will bring not only a clear understanding of whether backward time travel is possible, but also an understanding of many other mysteries, including how our Universe was born (see the Plus article What happened before the Big Bang?). Stephen W. Hawking, The Chronology Protection Conjecture, Physical Review D, 46, 603 (1992). John Friedman and Atsushi Higuchi, Topological Censorship and Chronology Protection, Annalen Phys. 15:109-128,2006; also available on the web. Matt Visser, The Quantum Physics of Chronology Protection, in The Future of Theoretical Physics and Cosmology: Celebrating Stephen Hawking's 60th Birthday, edited by G.W. Gibbons, S.J. Rankin and E.P.S. Shellard (Cambridge University Press, Cambridge, England, 2003); also available on the web. Kip Thorne, Black Holes and Time Warps: Einstein's Outrageous Legacy, Norton, 1994: Chapter 14. Lawrence H. Ford and Thomas A. Roman, Negative Energy, Wormholes and Warp Drive, Scientific American, January 2000. For the past twenty years, Ford and Roman have been the leading researchers on deducing what the laws of physics say about how much negative energy one can accumulate by lending. S.W. Hawking, Chronology Protection: Making the World Safe for Historians, in The Future of Spacetime, volume authored by S.W. Hawking, K.S. Thorne, I. Novikov, T. Ferris, A. Lightman and R. Price (W.W. Norton, New York, 2002); see also Chap. 5 of S.W. Hawking, The Universe in a Nutshell (Bantam, New York, 2001). Section 1.8 and Exercise 1.16 of a textbook that Roger Blandford and I expect to publish next year; an advance copy is available on the web. If you understood the cause of Gravity, then you would know that time travel is possible as I do. Jump off a building or out of an aeroplane and you don't need fuel to accelerate. Simply creating a G-field in front of a craft would cause the craft to 'fall' towards that field which would in turn be projected further ahead causing an exponential acceleration curve up to and far exceeding the speed of light. One must also realize that only one half of any trip could be accelerated towards and the remainder must be decelerated in the opposite direction to arrive at the destinations relative speed. It looks like somebody doesn't understand relativity. Our current understanding of physics dictates that we cannot travel faster than the speed of light. Even with an extremely fast acceleration, from at least one reference frame, if an object has mass, it will never reach the speed of light. Accelerating an object with a mass's speed to the speed of light would require an infinite (read: extremely massive) amount of energy that we just aren't capable of producing. Sure putting a gravitational field in front of an object would produce a force, but just how massive would would the object have to be to produce a gravitational field that produces enough force to actually accomplish something within a limited amount of time? It would appear that the only hypothetically feasible object to use would be a black hole, and even those are not known well enough to do anything useful with them. It's useless talking about how we are going to accomplish time-travel if we don't even have all of the (mathematical) tools available to evaluate the situation. Time-travel is not possible for the good reason that time does not exist, so I would answer no(!) if someone asked me that question. A very clear and enjoyable article. Thanks. I am a student in 12th grade. I really do not have the mathematical advantage nor the complete skills related to quantum physics, but yes timetravel and quantum gravity is something I am immensely interested in and have been reading about this for a very long time. I found this article very interesting and it has left me wondering what would be going on in the mind of "physics" when it came into existence. Why will it not want us to do something and why permit something else. And if the laws of physics break down, and maybe if I am the one who's behind it, wont I have the freedom to make new laws of my own which permit time travel? Its like I find a way to break something to the ground and build it up again as per my fancy? And well, I have been going through a few books on quantum physics and I would love it if someone can suggest a book on mathematics which will help supplement my present reading. A very interesting article but I have to politely disagree. Firstly because no proof of times existence is given or referred to. Specifically no proof is given that as things move change and interact, a thing called time needs to exist, or 'passes'. From the outset the suggestion "The laws of physics allow members of an exceedingly advanced civilisation to travel forward in time as fast as they might wish." May be seriously flawed. Relativity, as in GPS systems for example, does indeed show that fast moving objects 'change' more slowly. And as they do so it can be said the surrounding matter effectively changes more quickly. Thus a fast moving astronaut might return to earth finding it very different than might be expected. But unless proof is given that time, and 'the future' actually exist, all this proves is that matter exists, moves, changes and interacts 'now' -at different rates under different conditions. And not, IMO, that time, the future, or time travel may exist. (Note, in 'electrodynamics' Einstein only -states- that a rotating hand on a numbered dial (a 'watch') shows the existence and passing of a thing called time. But logically, no matter how many people assume this is correct, without actual, scientific, experimental proof, all such a device shows is that motors can rotate hands. And thus SR only shows that moving motors etc run more slowly than (relatively) stationary ones). In this article the wormhole is suggested as a possible time travel device. The only problems suggested being that exotic matter would be required, or it might necessarily self destruct re the laws of physics. i.e be practically impossible. but unless it is proven that there is indeed a past and/or future then perhaps Relatvity just shows how matter might be warped, stretched, and dilated in its rates of change - but not over a thing called time. Time is indeed a cultural construct. This is in part demonstrated by differing notions of time in different cultures. Part of the strength of modern physics is that it has allowed useful mathematical calculation of some of what is entailed in passing through a wormhole. Part of the challenge is that this infrastructure provides restrictive overhead for properly understanding and moving toward a deeper knowledge. One obvious example for both of these comments is the apparent requirement of a physical process for creating a time travel machine, and for keeping the wormhole open. The actual resolution of this matter may emerge from use of different mathematics and innovative experimental procedures. An attitude of open inquiry will be very important. Some time ago, as a graduate student in physics, I posited to a leading physicist at MIT that there might be two dimensions to time, or that time might behave differently than we think it does. He was outraged, and the conversation ended there, but now Kip Thorne and colleagues have done some of the work implied. So my hat is off to them. I think significant answers are just around the corner, and it will take considerable meticulous effort to get there. Kip Thorne's work in the area has come a long way in very few years. I recently purchased two websites Spacetime.University and Time.University which I plan to post content related to Spacetime and Quantum Time mathematics. For now most of my tutorials etc are on the website Spacetime.University. I am a big fan of Kipe Thorn's ideas. Some of Kip Thorne's ideas get a mention. Any feedback is appreciated. My project is very new so any suggestions such as websites to link to or comment on content would be appreciated. We are all time travellers as time is just a measure of the rate at which the universe is running down, i.e. increasing entropy, so is always in that direction. If time travel was allowed in the reverse direction then we would need to send an observer back to experience it as such. Unfortunately this would also mean that, as far as this observer is concerned, it would have to put the WHOLE of the universe, i.e. every particle, each and every one in its original position and each with its original momentum and ground energy as they were back at the time the observer makes the journey INCLUDING the particles that make up the observer! This might be the reason for the observer (the time machine) vanishing in a violent explosion as its constituent parts tear of to their various origins at that distant time and place. I am well aware that I am missing the theoretical knowledge and the mathematics to describe what the above words mean but I am pretty sure this is the way it works no matter how many mathematical fuddles are used to get over this simple concept of why we cannot fight the whole of the universe and the universal increase in entropy as we are part of it and cannot stand apart from it such a way that we are not torn to shreds as our atoms are dispersed through time and space to regain their positions at the time we seek to visit. This is what it really means to go back in time to a universe as it was, back then. If you had at your disposal a universe full of energy, the knowledge about all its constituent particles, and the wit to control all of this, then you might, just, have a chance. I am also aware, as are others in the earlier comments, that what we called time is not a real thing it is just the measure of the rate of change of entropy which we also know can vary, relatively, in the forward direction simply by accelerating, relative, to another body such that our rate of change of time is different to the body that is not accelerated. Time appears to be a construct of the mind to enable us to comprehend change and exchange ideas about such change in much the same way as we agree about colours as we can never be certain that the colours we perceive are the same as those perceived by others. Time also flows differently according to mood which also seems to suggest it is a construct of the mind and not a real phenomenon. There have been designs for interstellar ram-jets that collect hydrogen nuclei using huge electrostatic collector/compressors to fuse these together to make heavier nuclei which they expel out of the back at very near the speed of light thus propelling the ship at, say, a constant 1g using the energy from the, free, interstellar hydrogen fuel. This, if perfected, could make the Nebulae in Andromeda about a lifetime away for the travellers but about 2.5million years, each way, for those living on Earth. There is, of course, the ablation and radiation due to the extremely high energy particle flux (blue shifted, to overcome - maybe we would have to convert a trillion tonne asteroid into a spaceship - or, just maybe, it is all just a pipedream! In any case this is still time travel into the future, not the past. I would be very much obliged for a critique on the above ideas as I have long (50 years or more) wondered why I have not seen this idea posited anywhere else as it seems such a reasonable rebuttal to the question of the possibility of time travel into the past. As long as we continue to think of the 'arrow of time' time travel will not be achieved, at least not in the sense we wish. For Time Travel proper, Time itself must exist as a genuine entity as does does Space and therefore have separate dimensions of its own.